A new genetic study claims that the origins of olive domestication are in West Asia, more precisely at the Turkish-Syrian border (Kurdistan again? ), apparently settling the doubts on whether this tree’s domestic variant may have originated either in that area, the Aegean Sea basin, Southern Iberia or North Africa, or even that many independent domestications had taken place. The location and timing of domestication of the olive tree, a key crop in Early Mediterranean societies, remain hotly debated. Here, we unravel the history of wild olives (oleasters), and then infer the primary origins of the domesticated olive. 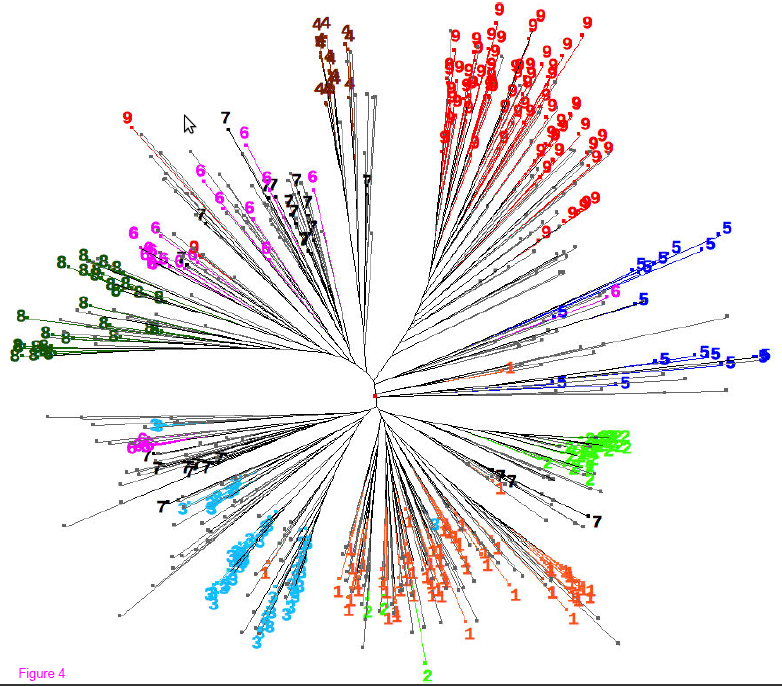 Phylogeography and Bayesian molecular dating analyses based on plastid genome profiling of 1263 oleasters and 534 cultivated genotypes reveal three main lineages of pre-Quaternary origin. Regional hotspots of plastid diversity, species distribution modelling and macrofossils support the existence of three long-term refugia; namely the Near East (including Cyprus), the Aegean area and the Strait of Gibraltar. These ancestral wild gene pools have provided the essential foundations for cultivated olive breeding. Comparison of the geographical pattern of plastid diversity between wild and cultivated olives indicates the cradle of first domestication in the northern Levant followed by dispersals across the Mediterranean basin in parallel with the expansion of civilizations and human exchanges in this part of the world. 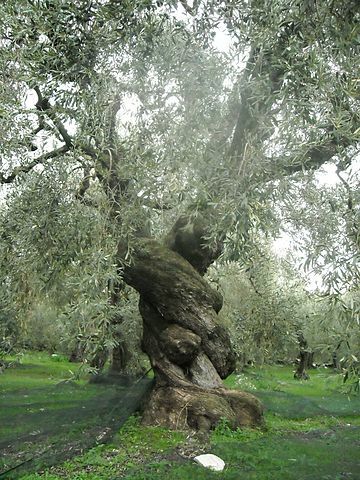 The study was made only on chloroplast DNA, roughly equivalent to animal mtDNA, transmitted only by the “female” line (notice that olive trees, as most plants are dioic, having both sexes and also that the preferred method of agricultural reproduction today is growing new trees from stumps, i.e. cloning). However André Berville, geneticist of the French National Institute for Agricultural Research prefers to remain cautious because, in his opinion, looking only at chloroplast DNA is not enough. “Pollen from the olive tree is wind-transported, so it can migrate long distances” he said. Combining both types of DNA would allow researchers to understand both how local olive tree cultivation occurred and how more long-distance changes occurred, he said. Secondary source: NBC News (via Pileta). China is rich of germplasm resources of common wild rice (Oryza rufipogon Griff.) and Asian cultivated rice (O. sativa L.) which consists of two subspecies, indica and japonica. Previous studies have shown that China is one of the domestication centers of O. sativa. However, the geographic origin and the domestication times of O. sativa in China are still under debate. To settle these disputes, six chloroplast loci and four mitochondrial loci were selected to examine the relationships between 50 accessions of Asian cultivated rice and 119 accessions of common wild rice from China based on DNA sequence analysis in the present study. The results indicated that Southern China is the genetic diversity center of O. rufipogon and it might be the primary domestication region of O. sativa. Molecular dating suggested that the two subspecies had diverged 0.1 million years ago, much earlier than the beginning of rice domestication. Genetic differentiations and phylogeography analyses indicated that indica was domesticated from tropical O. rufipogon while japonica was domesticated from O. rufipogon which located in higher latitude. These results provided molecular evidences for the hypotheses of (i) Southern China is the origin center of O. sativa in China and (ii) the two subspecies of O. sativa were domesticated multiple times. Figure 3. Population structuring of O. sativa and O.rufipogon. Figure 4. A map showing the sampled populations of O. rufipogon and the distribution of haplotypes. From fig.2 we know that H1 corresponds to the haplotype found in O. sativa var. japonica (temperate climate variant) and that H2 and H3 correspond with the haplotypes found in O. sativa var. indica (tropical variant). However notice how rare is the indica cluster in Tropical China O. rufipogon and that the exact combo only seems to show up in Hainan. 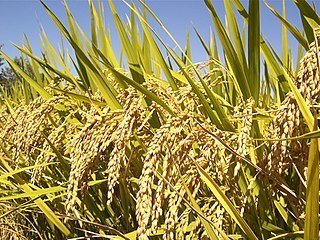 For this reason, I would suggest future researchers to study the ancestor species also in Indochina, so we can understand better the origins of rice and particularly the indica variant, especially associated to Austroasiatic speakers now living almost exclusively in Indochina and parts of India. But one thing is loving tomato sauce, tomato salad, tomato in sandwich or other tomato based cuisine and another thing is to know much about its origins. Tomato, Solanum lycopersicum, is divided into two widely distributed varieties: the cultivated S. lycopersicum var. lycopersicum, and the weedy S. lycopersicum var. cerasiforme. Solanum pimpinellifolium is the most closely related wild species of tomato. The roles of S. pimpinellifolium and S. l. cerasiforme during the domestication of tomato are still under debate. 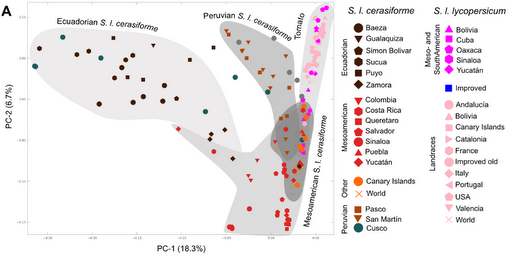 Some authors consider S. l. cerasiforme to be the ancestor, whereas others think that S. l. cerasiforme is an admixture of S. pimpinellifolium and the cultivated S. l. lycopersicum. exported to the rest of the world. Huw Jones et al. 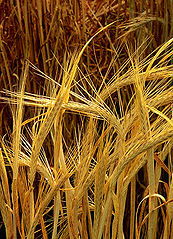 Evolutionary history of barley cultivation in Europe revealed by genetic analysis of extant landraces. BMC Evolutionary Biology 2011. Open access. These landraces are what was being grown traditionally before the advent of 20th century industrial homogenization of crops. The authors discern nine populations using STRUCTURE, however, as we can see in fig. 4 below, some of these populations are paraphyletic. The authors inform us in greater detail of the characteristics of the various populations within the paper’s “origins of the populations” section.